Commercial carrot and tomato juices (final concentration: 90 % juice, v/v) were added with a phenolic extract from apple peels consisting mostly of flavan-3-ols (>50 %), flavonol glycosides and dihydrochalcones in order to enhance their antioxidant capacity. The antioxidant contribution of the added extract to the capacity of the hydrophilic and lipophilic components of the juices was measured as ascorbic acid equivalents with ferric reducing–antioxidant power and radical scavenging capacity against DPPH˙ assays, and as inhibition against lipid peroxidation using an emulsified lipid in an oven test. 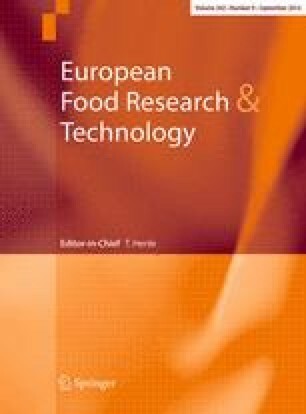 Results showed that the addition of apple peel flavonoids at concentrations equal to or above 160 mg gallic acid equivalents (GAE)/L as total phenolics in the juices led to significantly higher (p < 0.05) radical scavenging capacity and to an increased protection against lipid peroxidation compared to control. The oxidative index of the model emulsified lipid with added enriched juices (20 mg/L as GAE) was lower than the control and comparable to a mixture of synthetic antioxidants (25 μM). The antioxidant capacity of the enriched juices was mostly attributed to their hydrophilic components, particularly flavonoids with medium-to-high polarity such as catechins, dimers of (+)-catechin and (−)-epicatechin and quercetin glycosides. Nevertheless, it was suggested that oligomeric procyanidins with medium-to-low polarity could also contribute to the total antioxidant capacity as lipophilic components. The authors would like to acknowledge the financial support of the DIT Strand III 2007–2010 for the carrying out of this project.